There is a saying that every myth has an element of truth in it. Hypnosis is still surrounded by myths in popular culture, and that saying is true for these, my favorites as the 12 worst hypnosis myths. Here are the 12 worst hypnosis myths with the element of “truth” on which they are based, and the facts about those myths that bust them. Hypnosis is associated with magic, the supernatural, or the work of the devil. Basis #2: Results of hypnosis cannot be adequately explained by material-based science because hypnosis involves the sub-conscious mind, and the mind is more than the physical brain. What we cannot totally explain by science is often considered “beyond the natural laws” (as we understand them) or “supernatural.” (Remember that Galileo Galilei was condemned of heresy by the Inquisition in 1615 for stating that the earth is not at the center of the universe and that it moves around the sun). Fact: Hypnosis is a natural human state experienced by everyone. It has been extensively studied scientifically. Although we still don’t understand much about the mind, we do know how to focus its powers to get results through hypnosis. Hypnotherapy is based on many years of clinical research and documentation by famous psychologists. A hypnotist is a person who has mysterious or unusual magic-like powers. Basis: What we don’t understand appears magic-like to us. Fact: A hypnotist does not possess any unusual powers. Hypnotherapists are not psychics, magicians, palm-readers, or claiming any “special powers.” The hypnotist has learned the science and art of effective communication with the subconscious. Fact: The hypnotist knows that everyone hypnotizes themselves and that the trance state is a normal part of everyday life. We are entranced by music, by love, by art, by yoga, in meditation, in prayer, and in the boredom of freeway driving. The hypnotist assists the person desiring transformation to communicate more directly with their subconscious to make the change desired. Fact: Anyone can learn the skills and become a certified hypnotherapist with the proper training. (See how). The hypnotist may teach the person how to hypnotize themselves whenever they want, as we routinely do at Tooley Hypnosis (See self-hypnosis training schedule). Basis: Whenever we see a person being very still with their eyes closed, we think they are either asleep or unconscious, and hopefully not dead! Fact: Hypnosis is not sleep or unconsciousness. You are awake in an active state of heightened inner awareness where they can hear and speak to the hypnotist and continue to make choices and decisions. It is an opportunity to “have a conversation with your subconscious.” Because you are so inwardly focused, you relax your muscles with closed eyes and your body is motionless. Therefore if someone saw you, they might think that you were asleep or unconscious because that is usually the story when we see someone still with their eyes closed. Fact: Sometimes a hypnotized person passes from hypnosis into sleep. When this happens it is because the person is completely relaxed and wanted or needed to sleep. They will awake very refreshed from the experience. Fact: Listening to a hypnosis audio recording at bedtime is a wonderful way to both reinforce your desired change and relax comfortably into sleep. I recommend it. The hypnotist will be able to control my mind. Basis: In entertainment hypnosis the volunteers do what the hypnotist instructs, even if it is silly things they would not ordinarily do. Fact: No one can control your mind, unless you let them. Your hypnotherapist will give you suggestions that you want to be given, based on the information you provide during the interview in the first part of your session. At no point during your session will you lose control of your mind. You will remain free to decide to follow a suggestion or not, whatever you choose. (See myth # 12 for a complete explanation of entertainment hypnosis). A hypnotist can induce a person to commit a crime or something they consider immoral. Basis: The book “The Manchurian Candidate” and the two political thriller films based on it (1961 and 2004) depict a person brain-washed (or hypnotized) to commit crimes when triggered by seeing the queen of diamonds playing card. Similar videos produced for entertainment revenue continue to attract an audience, and hence the myth is propagated. Fact: Surrendering to a very domineering or unscrupulous personality can, however, result in a form of brain-washing if sufficiently repeated. Remove yourself immediately if you sense this happening from any hypnotist, preacher, politician, telemarketer, or advertiser! I will embarrass myself by revealing something I have kept secret. Hypnosis can get someone to “confess”. Fact: Hypnosis for therapy is not hypnosis for entertainment. You will only speak about what is necessary to resolve the issue that you have chosen for hypnosis resolution. Your therapist doesn’t care what you may have done, and is bound to keep it confidential. He is only there to help you achieve what you want, and has probably heard it all before anyway. You can resolve issues by admitting to yourself the source without telling the details to the hypnotist. A person in a hypnotic state may not be easily awakened and may remain in that state for a long time. Hypnosis is a dangerous experience. Basis: Speculation that a hypnotized person is in a very deep, comatose state and that the action of a hypnotist is necessary to bring a person out of that state. Fact: “Awakened” is not the proper term, because the person was never asleep. The hypnotist knows and uses the correct method to bring a person back from a trance state to “normal room awareness” at the end of the session. Even if this were not done, the person will exit the hypnosis state naturally when they are ready. Fact: There is no historical record of anyone ever failing to emerge from a hypnotic state! Fact: As part of your self-hypnosis training, you will learn how to both put yourself into trance and how to bring yourself out of trance whenever you want. Hypnosis is very safe and is in fact, a state of hyper-awareness. My clients report hearing every little sound, but able to ignore them. If there were an emergency, you would naturally be able to come out of the hypnotic state by opening your eyes, and stretching or speaking. I can’t be hypnotized because my mind is too strong and disciplined. Basis: Some people report that they tried hypnosis and they were not hypnotized. Fact: Because hypnosis is such a natural, familiar state, many people who are successfully hypnotized do not think they were hypnotized until they experience the results that they programmed themselves to achieve under hypnosis. Many of my clients tell me later that they didn’t think anything happened until they experienced their desired change in their life. Fact: Because hypnosis accomplishes change in the sub-conscious without active participation of the conscious mind, the conscious mind afterward is often unaware of the changes as they take place. I have had clients who did not notice that their life had dramatically changed because it felt so familiar, natural, and effortless. They became aware that what they had programmed under hypnosis was now occurring in their life only when a friend or family member called their attention to their changed behavior. “Willpower” is not required because the sub-conscious easily implements the desired adjustment. I have never been hypnotized before. Basis: You have never seen a hypnotist or hypnotherapist. Fact: Every person naturally enters a state of hypnosis at least twice every day: just before falling asleep at night, and upon awaking every morning before getting out of bed. Formal hypnosis simply duplicates the relaxed, partly drowsy, highly-suggestible state of those two times. Fact: Most people easily enter a state of “environment hypnosis” while at the movies, watching TV, driving on the highway, or while reading a good book. Fact: If you have ever been in love, that is the ultimate hypnotic state! After hypnosis, I will have no memory of the session and won’t know what happened. Basis: You don’t remember things from when you are asleep or unconscious. Fact: Hypnosis is not an unconscious state or sleep. In fact, most people report having a heightened sense of awareness, concentration, and focus. You will have a conversation with me as your hypnotist during the session. I will instruct you to remember everything. You will get some reminders of the session to take home with you as reinforcements afterward. Hypnosis is not effective or takes a lot of expensive sessions. Basis: Many types of therapy take a lot of sessions, so hypnosis must take many sessions too. Fact: Hypnosis is very effective. Many hospitals use some form of hypnosis to prepare patients for surgery and assist their rapid recovery. Hypnosis is THE most effective method of releasing the tobacco habit. (See the medical study LINKS for a large body of evidence on the effectiveness of hypnosis for nearly the entire spectrum of human experience). 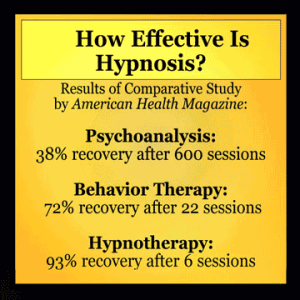 Fact: Some issues can be solved with a single hypnosis session reinforced by personal self-hypnosis. More deeply entrenched issues take a FEW sessions. I will do embarrassing things, such as imitate a dog, chicken, or duck. Basis: Observing entertainment hypnosis where the volunteers do these things when instructed by the hypnotist. A stage hypnotist is hired to entertain a group. The hypnotist asks for volunteers who want to be hypnotized. Volunteers from the group come up on stage. Most of them are just curious. By volunteering, they have made a tacit agreement with the hypnotist: “We are going to have fun doing whatever you say, even being silly!” They know that they can always blame anything they feel embarrassed about afterwards on the hypnotist. Often one or more of the volunteers has a different purpose, namely, to “bust” the hypnotist and prove that hypnosis is a fake. (I call them the “disrupters”). The hypnotist’s first task is to sort out these disrupters and tell them to go sit back in the audience. (If you have seen a stage show, you may remember seeing the hypnotist send someone off the stage). The hypnotist then hypnotizes the volunteers. The hypnotist gives them some silly things to do and they do them (to varying degrees). Those hypnotized have a choice to accept or reject the suggestions to act like a chicken or dog, and many accept them! (Perhaps they deny their choice afterwards because of embarrassment or some other reason). The hypnotist may tell a person to be “rigid as a piece of steel” and then support them horizontally by only head and heels. 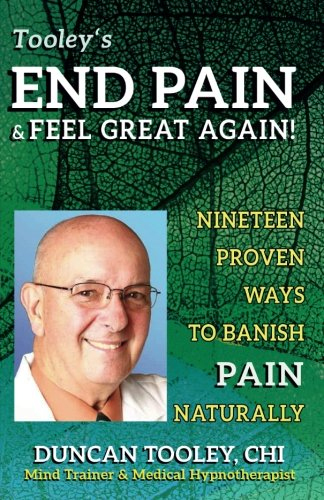 (This demonstrates the extreme power of your sub-conscious mind over your body because staying stiff horizontally is something you cannot do consciously)! During a conversation, when the hypnotist casually says “blue” the person involuntarily jumps up and cheers but doesn’t really understand why he did it. Some inner impulse just caused them to do it. Everybody laughs and has fun, and the awesome power behind hypnosis is revealed as available for therapeutic or performance use. You accept suggestions more easily when hypnotized. Post-hypnotic suggestions work automatically without thought because they come from the sub-conscious. Now that you know better, utilize the safe power of hypnosis to get the life that you want. You can repair your body, eliminate illness, add skills, drop useless habits increase your performance and joy. 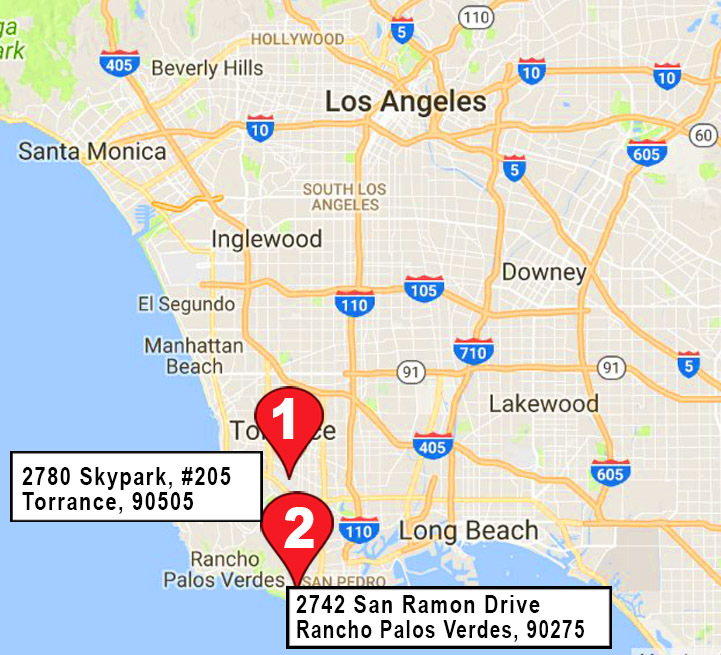 Call me at 310-8321-0830 to discuss your challenge and make an appointment or register for a training class.